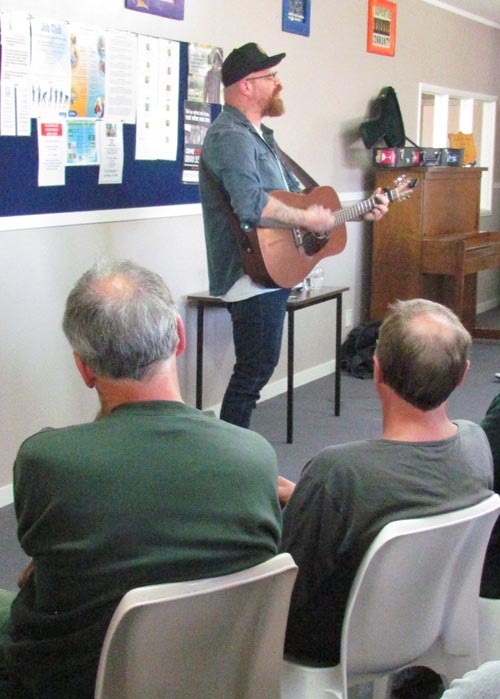 Arts on Tour New Zealand’s touring artist – singer songwriter Adam McGrath from the band The Eastern – has “done it solo”, performing to prisoners at Christchurch Men’s and Rolleston Prisons. It was part of an Arts Access Aotearoa initiative. Adam has performed all over New Zealand, in Australia, and the United States. He is fondly remembered in Canterbury for his morale-raising community work not long after the Canterbury earthquakes. He has been nominated for various music awards, and has been described as “a national treasure” on Radio New Zealand; as “New Zealand’s toughest-minded songwriter” by Graham Reid from the New Zealand Herald; and as “The Truth” by Barry Saunders of The Warratahs. His song Hope and Wire became the inspiration and theme song for filmmaker Gaylene Preston’s TV3 drama series detailing life in post-earthquake Christchurch. His performance in the prisons carried a message of empathy and encouragement, using music as an emotional outlet and an alternative tool for change. In his performance to the prisoners, Adam explored what led to a successful path and journey in life for an everyday kiwi. Adam’s performance was interactive. As well as the music, it included interactive storytelling and engagement with the group, and a discussion using music and poetry to express emotions and build or rebuild family relationships. “There are many men in our prisons who have extraordinary hidden talents,” Maree says. “We often find through the arts programmes that these men are coming forward, realising that they have other ways to communicate and to share their thoughts. Some even go on to work professionally in the arts. Arts Access Aotearoa approached Christchurch Men’s Prison earlier in the year with an opportunity to be involved with Arts on Tour New Zealand’s programme. “Participation in arts opportunities can lead to very positive rehabilitation outcomes for offenders,” says Richard Benge, Executive Director of Arts Access Aotearoa. With funding from Creative New Zealand, Arts On Tour New Zealand organises tours of New Zealand performers. It liaises with local arts councils and community groups to bring the best of musical and other talent to country districts. Each month a different act is scheduled to travel nationwide performing at selected venues. Original generation time 1.7471 seconds. Cache Loaded in: 0.0332 seconds.